Thanks to some serious flooding of the West Fork of the Trinity River resulting in several deaths over the years plus the need to make some work for the poor farmers and ranchers who were on their last leg because of the Great Depression, the Lake Bridgeport project began in 1929. During the construction of the lake and dam, entire families would camp out onsite in tents so they could make two or three dollars a day to feed their families. Workers drew lots to get sections of the lake to remove mesquite trees or heavily timbered areas. Building of the levees and dam was all done by hand with rocks and other construction materials brought in by wagon from the surrounding area - to keep the locals employed, trucks were not allowed. Despite tough times, there was a lot of excitement among the workers and locals in being a part of what was supposed to be the largest man-made lake in Texas at the time. Construction was completed in 1931. Lake Bridgeport is 11,954 acres, 20 miles long, has 170 miles of shoreline, and has a maximum depth of 85 feet. The Lake is partially developed with rolling hills and lots of trees. There are several bluffs and a variety of coves that are excellent for swimming, skiing, and fishing. It's a very pretty lake with nine islands and fairly clear water thanks to a rocky shoreline and bottom. 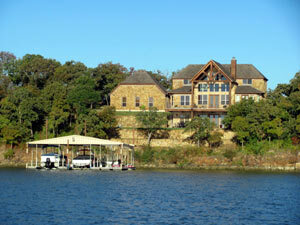 The lake offers a great escape from the crowds of an urban setting with its gorgeous cliffs and pristine water. Lake Bridgeport is a popular spot for fishing, recreational boating, and smooth water for boarding, swimming, tubing, or skiing. There is limited camping, a few rental cabins and houses, 5 public ramps, and a couple marinas with gas, ice, bait, and a few supplies.